On all levels, the Trump administration’s ‘Zero Tolerance’ policy on illegal immigration is an unmitigated disaster. Politically, the policy has put the Trump administration on the defensive on immigration at a time when the public’s support for increasing levels of immigration is at its highest level in 20 years. Taken together, those two trends will spell disaster in November for the Republicans. Many conservatives still believe the GOP can win in November if they convince the voting public of the Democrats’ supposed desire for ‘open borders.’ But considering most everything Trump has done with respect to illegal immigration was also done on some level during Barack Obama’s administration, the mainstream Democratic Party has its own anti-immigrant flag it can wave at selectively targeted voters. Perhaps if the Trump administration’s efforts to slow illegal immigration had been well-planned and humane that political strategy would have merit; but, in the wake of the ‘Zero Tolerance’ policy and its family separations, scaring the public about the Democrats’ views on immigration has become much harder. Even worse for the Republicans, the ‘Zero Tolerance’ policy has robbed the Trump administration of its months-long momentum in public support. Coming out of the Singapore summit, Donald Trump’s presidency was experiencing its highest levels of public support since early in his term. And now? 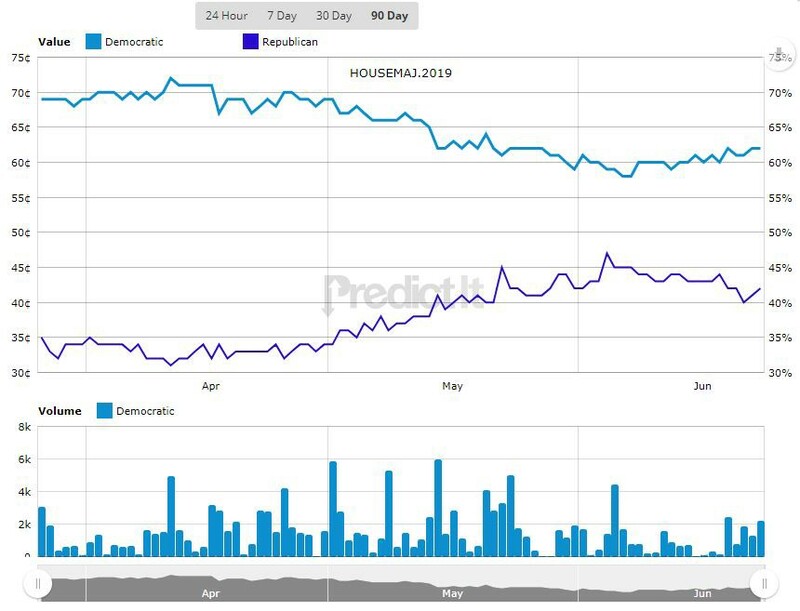 According to the political futures market, PredictIt, the Democrats’ chance of regaining control of the U.S. House has risen from 58 percent in early June to 62 percent in late June. A four percentage-point increase may seem minor, but considering the Democrats experienced a 15 percentage-point decline in its chances between April and early June, a four percentage-point increase must feel like senior Trump adviser Stephen Miller and U.S. Attorney General Jeff Sessions just handed the Democrats a life-jacket. Some time soon, Trump needs to temporarily direct his ire away from the media and the Democrats and realize two of his closest advisers, Miller and Sessions, have single-handily jeopardized the Republican’s political fortunes going forward. Over 2,300 children were separated from their parents at the U.S.-Mexico border between May 5 and June 9 according to U.S. Customs and Border Protection. This human rights atrocity, the product of the administration’s septic form of nationalism and a systemic inattention to policy details, has no clear resolution in sight. According to Lisa Frydman, an immigration law attorney at KIND, an organization that protects unaccompanied children who enter the U.S. immigration system, there will be cases where children will remain back in the U.S. for months after their parents are deported. Even for a competent administration with a well-defined policy, family reconciliation could take months. On a social level, the ‘Zero Tolerance’ policy probably creates more problems than it solves. While Sessions said the policy is intended to deter future illegal immigration, including human trafficking, as of now, no evidence exists suggesting it has done so. And while Trump has defended his administration’s aggressive anti-illegal immigration policy as an aggressive approach to preventing the movement of MS-13 gang members into the U.S., there is a real possibility that the trauma thousands of children are experiencing due to the policy’s family separations may increase the risk factors in children associated with their joining gangs. On a moral level, this draconian and cruel immigration enforcement policy has been condemned by religious leaders across the country, including by Southern Baptist evangelicals at their recent annual convention. Internationally, the UN High Commissioner for Human Rights official called on Trump administration to halt its “unconscionable” policy, saying it punishes “children for their parent’s action.” How ironic it is that, as US Ambassador to the UN Nikki Haley and Secretary of State Mike Pompeo announce the U.S. is leaving the UN’s Human Rights Council, the U.S. is committing a human rights violation on a scale it hasn’t seen since our country’s internment of Japanese Americans during World War II. The premeditated and reckless infliction of traumas on children is morally indefensible. Sessions can quote all of the bible verses he wants on the importance of obeying the law, there is no biblical justification for separating families fleeing violence in their home countries. None. And, even if there were, it wouldn’t make its current implementation acceptable. The ‘Zero Tolerance’ policy (even without family separations) is a bad idea, and even if it should lead to fewer border crossings in the future, has only polarized the country more on the immigration issue and made it harder — not easier — to pass substantive immigration policy before the 2020 presidential election. Mr. President, you can start to minimize the political damage now. Please fire Stephen Miller and Jeff Sessions.